The World Health Assembly is taking place from 21-26 May. He said he is proud of the way the whole organisation responded to this outbreak and thanked partners, such as Médecins Sans Frontières (MSF – Doctors Without Borders), the World Food Programme, and the Red Cross for their swift response. “The best thing to prevent future outbreaks is to strengthen health systems everywhere,” he said. He mentioned several initiatives set up under his tenure, such as last week’s initiative to eliminate trans-fats from the global food supply, the High-Level Commission on non-communicable diseases, and an initiative on climate change in small island developing states. The WHO is also working on an “aggressive new initiative to jumpstart progress against malaria,” which still kills half a million people every year, he said. According to Tedros, the eradication of smallpox stands as one of the greatest achievement in the history of the WHO but also in the history of medicine. This victory shows “what WHO is capable of,” he said, adding that it could change the course of history, with partners. He said a few weeks ago, WHO established the Global Preparedness Monitoring Board, an independent initiative convened by the WHO and the World Bank. The initiative is to be led by Gro Harlem Brundtland, the former WHO director general, and Elhadj As Sy, secretary general of the International Federation of the Red Cross and Red Crescent Societies. The 13th General Programme of Work (GPW13) is “not about reinventing the wheel,” he said, but about making a bigger impact. The GPW13 is ambitious, and it must be, as “too much is at stake for us to be modest,” he added. 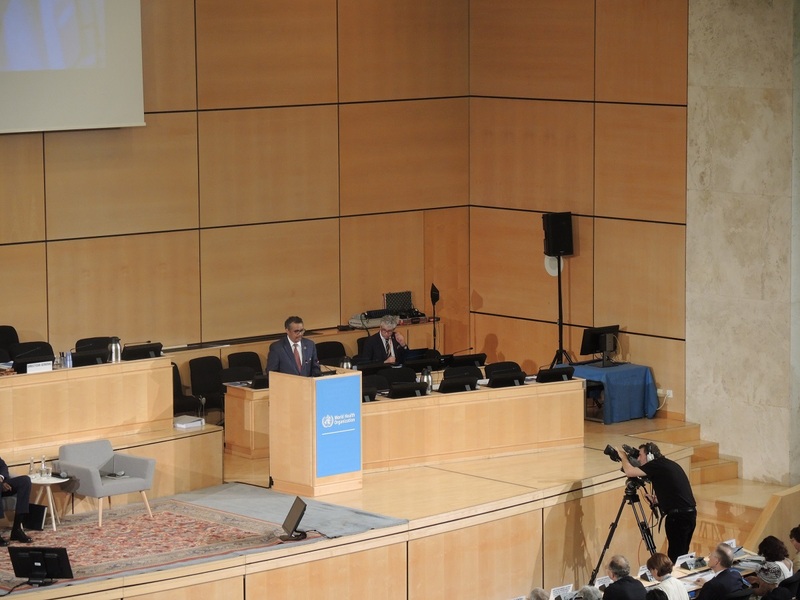 Dr Tedros described three keys to success for GPW13. The first, he said, is to have a stronger and transformed WHO, explaining that he has been focusing on laying the four foundations of this transformation, the first of which is the GPW13. The second of those foundations is a transformation plan “to make WHO more efficient and effective by streamlining the business practices that lead to wastage, that slow us down and hold us back,” he said. The third foundation is to have a strong senior leadership team, he said, underlining the number of women now in the WHO team, outnumbering men. The fourth foundation, he said, is the development of an investment case, describing what WHO could achieve, if fully funded. Earmarking – in which funds are provided for a specific purpose rather than left to the WHO’s needs – prevents the breaking of silos, and encourages internal competition for funds, and the chance of building a single, coherent WHO, he said, calling countries to provide flexible funding. He underlined the role of the WHO staff in the elaboration of GPW13 and said he considered concerns raised about interns. He said WHO has taken steps to improve conditions for interns, like providing health insurance, and lunch vouchers. Himself a former beneficiary of a WHO scholarship, Dr Tedros said this scholarship enabled him to do his Masters degree in London, and described himself as “a living proof” of the value of this programme. WHO plans to re-launch the WHO scholarship to enable students from low and middle-income countries to study abroad, he said. He insisted on the “zero tolerance” policy of the WHO when it comes to sexual misconduct in the context of several scandals being reported in humanitarian and development organisations. He praised efforts by Kenya and India to improve health conditions in their countries, and said Brazil has submitted a list of 10 commitments on universal health coverage. Japan, he said, has taken leadership and hosted the Universal Health Coverage Forum in Tokyo last December and committed US$2.9 billion to support universal health coverage in the world. He cited countries where he found universal health coverage is not a “pipe dream,” such as China, Cuba, Denmark, Oman, Saudi Arabia, Sri Lanka, Thailand, the United Arab Emirates, and the United Kingdom. He remarked on the “outstanding” example of Rwanda in its progress towards universal health coverage. The WHO commitment made in Alma-Ata to reach health for all has not been achieved, he said, but a second chance is at hand with the upcoming meeting of Astana, Kazakhstan next October, where countries are expected to recommit to primary care as the foundation and the future of health, he said. Dr Tedros remarked on the wealth of expertise, experience, skills, resources and network of outside health actors, advised not to listen to voices picturing partnerships as potential threats, and to make partnerships deeper and stronger. The WHO is reinforcing its ties with agencies such as the World Bank Group, the United Nations Development Programme, Unicef, the Food and Agriculture Programme of the UN, the World Organisation for Animal Health he said, as well as with partners like Gavi the vaccine alliance, and the Wellcome Trust. The WHO is also engaging with the private sector, “a crucial partner” in achieving health for all, he said. The WHO Framework of engagement with non-state actors (FENSA) must not act like a fence, he added. A letter was sent to the WHO a few weeks ago from Chancellor Angela Merkel of Germany, President Akufo-Addo of Ghana, and Prime Minister Solberg of Norway, calling on the WHO to take the lead on a global action plan to achieve healthy lives and well-being for all, ahead of the World Health Summit in Berlin in October, he said. “The WHO is proud to accept this challenge,” he said. "WHO Director Dr Tedros Opens First Annual World Health Assembly With ‘Keys For Success’" by Intellectual Property Watch is licensed under a Creative Commons Attribution-NonCommercial-ShareAlike 4.0 International License.